which includes crispy batter fried fish served in a warm,cozy tortilla along with pico de gallo,cabbage slaw,chipotle crema -makes an amazing Mexican dish if you have tried it or not,you will start loving it for sure! If you have been to Baja California Peninsula or not, but the moment you will sunk your teeth into these crispy batter fried fish tacos served with citrus cabbage, pico de gallo and topped with creamy chipotle cream sauce, you will experience the ultimate food satisfaction that you wont be able to describe. It's seriously that good. I had tried these Tacos long time back and when I wanted to recreate the same magic at home I was wondering how do I go about making them without going to Baja California. When I made them served with hot and crispy fish wrapped in warm tortilla the first bite was so amazing! What are Baja Fish Tacos? 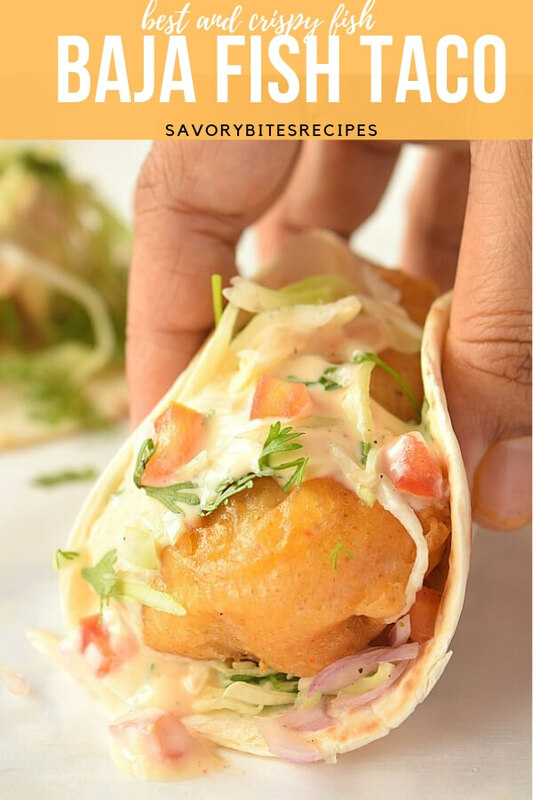 Whether you are Mexican food lover like me or no,when you will try these Baja Fish Tacos,you will definitely start to love Mexican food . 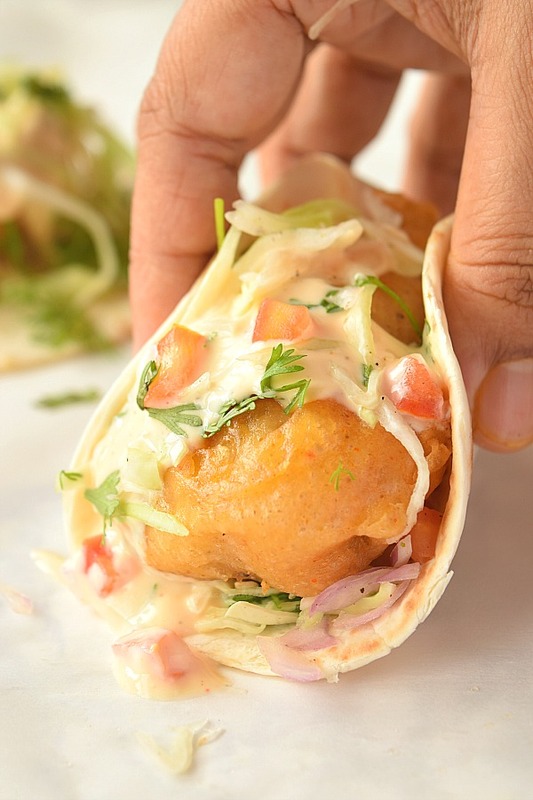 The Baja Fish Tacos are batter fried crispy fish(they not pan fried or baked ,but you can go for that if you do not wish for deep fried fish) served in a corn tortilla (you can optionally use flour tortilla) with pico de gallo,citrus crispy cabbage slaw and chipotle cream sauce. Where do these Baja Fish Tacos come from? Baja Fish Tacos originated in Ensenada,a coastal city in Baja Peninsula, Baja California, Mexico. The Baja Peninsula (Baja California Peninsula) extends from Tijuana, near the U.S. border, to Cabo San Lucas. What Fish can I use for Baja Fish Taco? A firm ,flaky and white fish is the best choice for these Baja Fish Tacos. Normally the choice is ranging from Halibut, Mahi Mahi, Cod, Tilapia, Grouper, Flounder. The best one is cod, cut into 1/2 inch thick piece and normally 3 inch long is the best choice. What is Baja Sauce made of ? The sauce options that would go well with these fish Tacos are various but the one that I have made is with Chipotle Chili in Adobo Sauce. 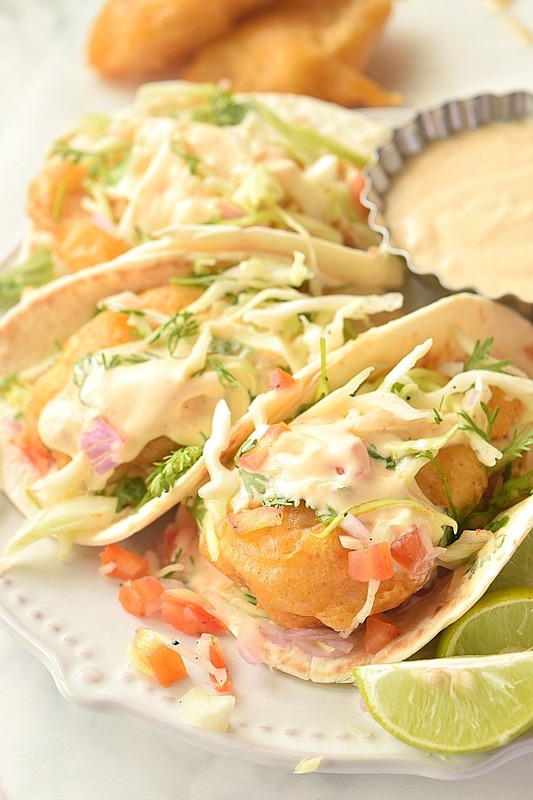 But you can make simple creamy white sauce also to go with these fish tacos. 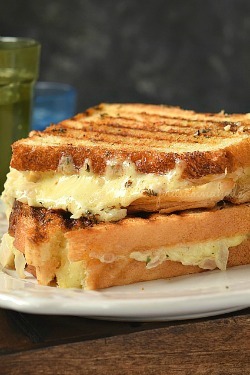 Just whisk together mayonnaise, sour cream, salt, pepper powder, garlic powder and lime juice. 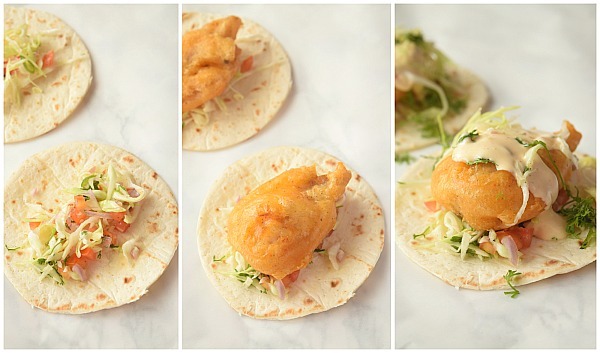 How to serve these Baja Fish Tacos? To serve these amazing fish tacos, start the assembly by warming the corn tortillas in microwave or on a skillet. If you are using microwave then cover the tacos with a damp cloth or kitchen tissue and microwave for every 10 seconds and check on them. What Toppings you put on Baja Fish Tacos? Firm White Fish: Use the flaky,firm kind of fish for this recipe. There are lot of choices available but the best one to use is cod. Chipotle Cream: In a blender pour all the ingredients mentioned and blend till smooth. I have used Chipotle in adobo sauce, Greek yogurt, mayonnaise, cilantro, cayenne pepper, garlic powder and sugar. Crispy Cabbage Slaw: Sliced/ shredded cabbage tossed in lime juice,salt and black pepper powder makes this citrus slaw. Pico de gallo: For this mix together chopped tomatoes, red onion chopped, jalapeno chopped, garlic powder, cilantro and lime juice. Corn Tortilla: These fish tacos are usually served with corn tortilla but if you cant find them then go ahead and use flour tortilla. 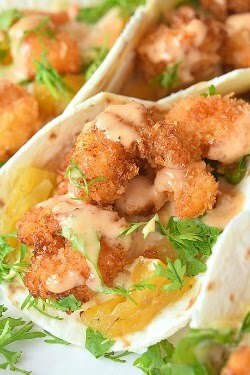 How to make / Steps to make Baja Fish Tacos? Clean and cut the fish into 1/2 inch thick pieces which are normally 2 or 3 inch long. Marinate these fish pieces with salt,black pepper powder and refrigerate. Make sure the fish pieces are dry and do not have water. Make the citrus cabbage slaw by mixing the shredded cabbage with salt, lime juice, black pepper powder. 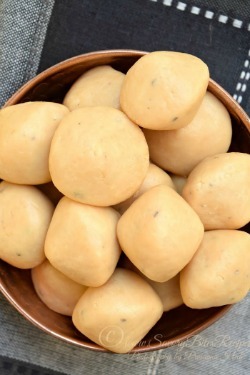 Toss well and refrigerate. Next in a blender add the ingredients mentioned for Chipotle sauce and blend well. Keep this refrigerated too. 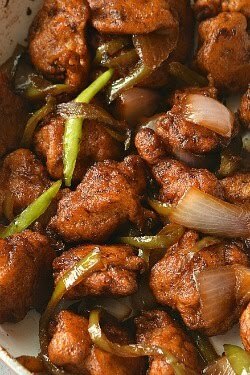 In a mixing bowl add the ingredients mentioned for batter except the soda water/sprite(if you consume alcohol then use beer). The batter should be of pancake batter consistency not watery but thick. Right before frying the fish add the soda water/sprite/beer to the batter and whisk. 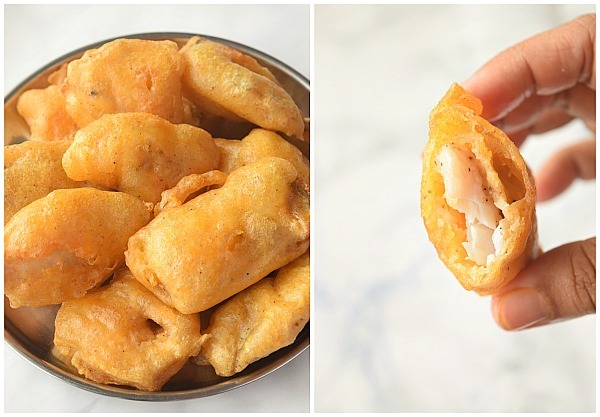 Once the oil to fry the pieces is hot,dip the individual fish pieces in batter and fry on medium heat till crisp,golden brown. Do not fry the fish on high heat as the fish will get burned and outside cover will be black. Drain the fried fish pieces on a wired rack to drain the pieces and keep crisp. Immediately assemble the tacos and serve,enjoy the taco while the fish is crispy and hot and sauce is cool. 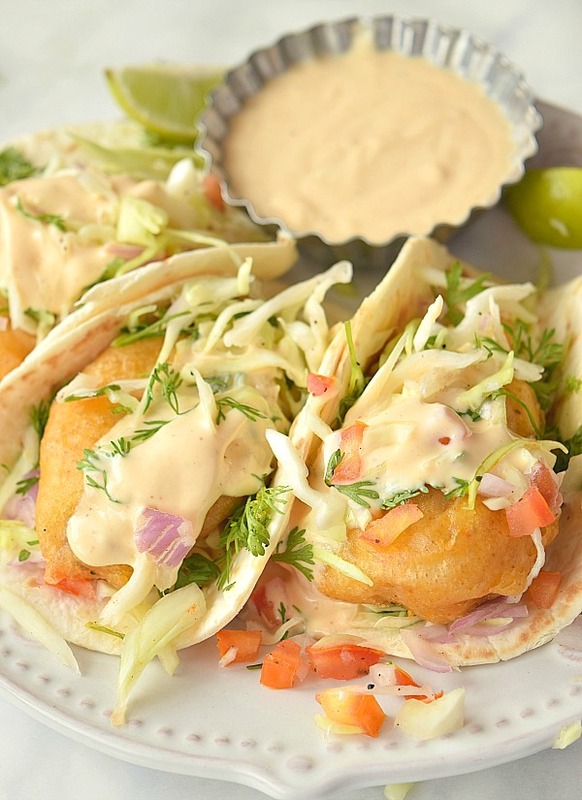 These Baja Fish Tacos are a combination of amazingly crispy fried fish by dipping fish in a coating of fluffy airy batter,fried to perfect golden brown color,served in a cozy warm tortilla with pickled cabbage slaw,pico de gallo and flavorful chipotle crema. In a bowl clean and pat dry the fish pieces. Marinate them with salt and black pepper powder. In a blender,blend together all the ingredients mentioned for Chipotle crema. In a bowl mix all the ingredients mentioned for batter except the soda water/sprite/beer. Mix it right before frying the fish. 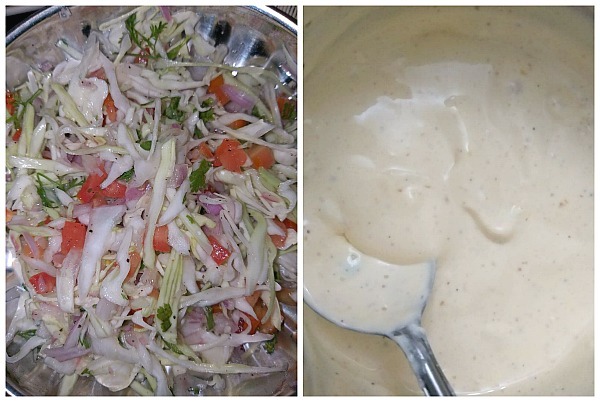 In a separate bowl make the citrus cabbage slaw. In another bowl mix the ingredients to make pico de gallo. 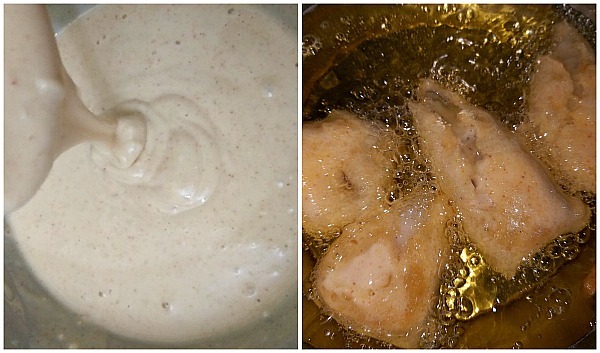 Mix the soda water / beer in the batter and dip each fish piece to coat the batter and slowly drop in oil to fry. Drain and keep the fish to drain oil on wired rack. To assemble,heat the corn tortilla covered in damp kitchen tissue in microwave every 10 seconds interval. Place the tortilla,add the cabbage slaw,pico de gallo,fish,chipotle crema,cilantro chopped,lime juice and serve immediately.